Extending HUMAX iCord – part 3 at Cat's Blog ..
Long long time ago and in between things have changed a lot .. today is “T-Day”, the development team of iCordForum.com community has updated all tools for the HUMAX iCord HD. Find below the official press release (in German and English). Das rein privat betriebene und größte deutschsprachige Forum zum Humax iCord HD veröffentlicht heute zu allen entwickelten Tools neue, deutlich verbesserte Versionen. Der alternative Kanallisteneditor Omega bietet verschiedenste Möglichkeiten, um die Kanallisten des iCord HD komfortabel zu bearbeiten und zu erweitern. Die Kanallisten weiterer HD-Receiver, wie vom HD-Fox oder dem neuen HD-Fox IR, können mit diesem Editor ebenfalls optimiert werden. Mit der Entwicklung von Platoon wurde erstmals die Möglichkeit geschaffen auch Videos (sowohl SD als auch HD) auf dem iCord wiederzugeben, die nicht mit einem iCord aufgenommen wurden. Somit kann der iCord-Benutzer nun auch für Urlaubsvideos, Aufnahmen vorheriger PVRs oder ähnlichem von der Wiedergabequalität des iCord HD profitieren. MiniRootFS – Cortex ist die Weiterentwicklung des ersten verfügbaren Patches der Firmware. Dieser erweitert den iCord HD u.a. um die Funktionen eines Media- und Sambaservers. Die zusätzlichen Dienste lassen sich über ein Webinterface steuern. Von dort aus können auch die Aufnahmen auf dem jeweiligen Gerät bequem verwaltet werden und stehen über den Webbrowser im gesamten Heimnetzwerk zur Verfügung. Updates und neue Funktionen lassen sich direkt über das Webinterface von iCordForum.com laden und installieren. Bei iCordForum.com handelt es sich um eine im Jahr 2007 gegründete, rein privat betriebene Initiative. Inzwischen hat sich um das Forum eine Community von über 14.000 iCord-Besitzern gebildet. Das Entwicklerteam des Forums hat mit den am heutigen Tage aktualisierten Tools auch außerhalb des deutschsprachigen Raums für Aufsehen gesorgt. Aus diesem Grunde werden alle Entwicklungen multilingual (bisher deutsch und englisch) ausgelegt. 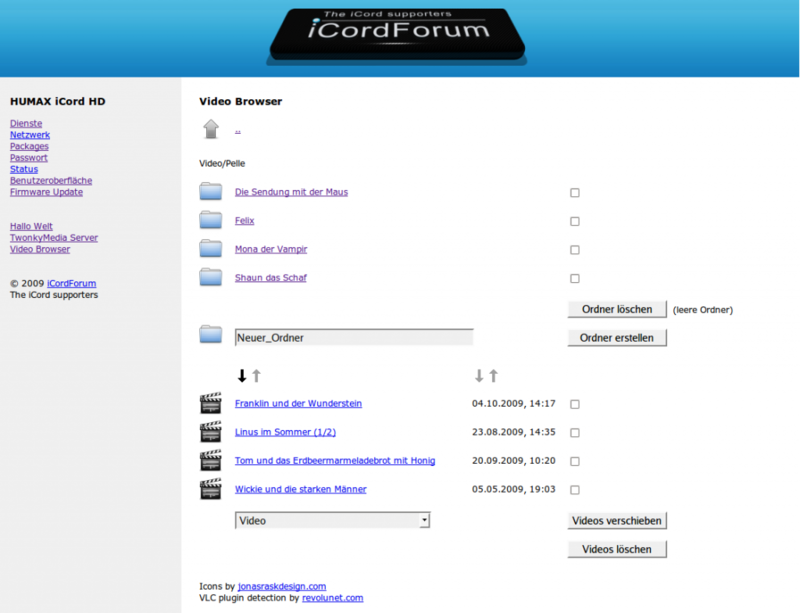 iCordForum.com, the private maintained and largest German forum for the Humax iCord HD, is publishing today new and improved versions of all developed tools. Omega, the alternative channel list editor, offers different capabilities for comfortable editing and extending of the iCord HD channel lists. The editor does work as well with other Humax HD settop boxes like HD-Fox or HDFox IR. Platoon allows at the first time to view non iCord HD recorded video files on the iCord HD after a format conversion. It extends the iCord HD to a multimedia player for private videos and recorded video streams from other PVRs. It enables the user to utilize the high quality video playing capabilities of the iCord HD. MiniRootFS – Cortex is an update of the first iCord HD firmware patch. This extension provides amongst other capabilities a Samba and a media server. All services can be controlled over a Web UI. This user interfaces also provides an access to the recorded video streams to view and organize these. The streams are available for viewing on all devices in a home network. The Web UI furthermore allows the maintenance and update of all provided components and services. iCordForum.com has been founded in 2007 as a private initiative. In between the iCordForum.com community has more than 14,000 registered users. The iCordForum.com development team could also gain a lot of attention outside Germany with the tools updated today. Therefore all tools will be provided with multi-language support (currently implementations are available with German and English language support). You’ll find all tools for download at http://www.icordforum.com/index.php?page=Thread&threadID=6633. The whole stack has been published under GPL license, so far everyone can download and use; nevertheless for download you need to register at iCordForum.com. As I’m part of the iCord HD firmware (root filesystem) extension dev team and responsible for the Web UI I’ll write some more in detail about this particular part. “MiniRootFS Cortex” is the name of the firmware extension, “MiniRootFS” stands for the extension and “Cortex” for the release (currently 1.1). What does MiniRootFS Cortex provide in a nutshell? One of the iCordForum.com members has created some youtube videos that show the different capabilities in detail .. The password is always the same for all services. Afterwards you should configure your network over the Web UI (Network), this switches off the original HUMAX iCord HD network configuration and gives you full control about the network properties for all purposes. It’s important to get help when struggling with some issues. The developers team and the iCordForum.com community provide offline support and in most cases we were able to solve all problems. That’s the advantage of community driven software development, so the easiest way to get hep (in German and English language) is to register, search and read and post questions. We’re still looking for developers that are willing to provide some time to help making iCord HD tools better. Easiest way to participate is to register at iCordForum.com and ask one of the developer leads how to join the team. To set the hurdle as low as possible for a quick start I created 2 additional resources for newcomers. The first one is a sample package called hello. It contains an sample extension of the Web UI and can be downloaded and inspected at http://www.icordforum.com/index.php?page=Thread&threadID=6385. If you need some assistance feel free and ask the forum for further details. Second piece is a virtual environment for testing purposes. It contains qemu (a virtual environment for MIPS (amongst others) running under Linux and Windows and a full configured virtual image running the base iCord HD firmware including MiniRootFS. It’s still pre-release (1.0.1) but the package structure is always the same so development could be started here. You can download the virtual environment at http://www.icordforum.com/index.php?page=Thread&threadID=6384. Someone might ask for next projects that are in our minds. These are only ideas but to give you a clue what might happen and to motivate you to participate I’ve collected some thoughts ..
It’s important again to refer ro the following statement .. The development team doesn’t take responsibility for any damage on your iCord HD. This is also included in the licenses by now. But anyway, we didn’t experience any case of damage of the iCord HD caused by our tools. You may also downgrade at any time to the original HUMAX firmware. So far .. enjoy the new capabilities! WEN THE NEXT FIRMAWRE ? AND WHAT’S NEW IT THEM ???????? CAN I CONFIGURE MY ICORD THROU UI AND THE CHANEL LIST? Posted on December 10, 2009 at 12:31 am. The Web UI can be used for video browsing and some basic configuration. iCord HD application parameters and channel list can’t be modified right now. Might be in further versions of MiniRootFS Cortex. I can’t tell anything about HUMAX’ plans to provide something like you asked, it’s in responsibility of HUMAX itself ..
Posted on December 10, 2009 at 12:44 am. and i hope soon we have ansers for those questions…. i will keep in touch…..
Posted on December 10, 2009 at 1:54 am. I am using the latest firmware and its great – thanks for all of your work on this. I also have a Technomate 9100S which also has a web GUI but has a few more feature included and I was wondering if you are planning on developing things further for the iCordHD. 2. To be able to change TV channel via the web GUI. These features would make the box fully web controllable which would be brilliant ! All we need then is the Astra2 7 day EPG with series links and I will be over the moon!! Thanks again for all the hard work everyone has put into this – the iCord is finally looking to have the potential I believed it had when I purchased it. Posted on January 7, 2010 at 4:51 pm. In first steps it’s very good if someone supports you, so hope to meet friendly and helpful people here. Let me know if I can help you. Posted on February 27, 2010 at 2:30 am. I would love to be able to use the software you have developed. It is exactly what many iCord users have been waiting for. Unfortunately, like many others, my Mac address disappeared after a firmware update so I cannot use it. I will unable to restore the Mac address until someone is kind enough to help translate the German “MAC-Adresse mit dem Loader U7.03 wiederherstellen” instructions. Posted on August 24, 2010 at 3:27 pm. Hugh, let me see what I could do to translate the appropriate sentences within next couple of days ..
Posted on September 1, 2010 at 7:12 pm. Over at the AVS forum “mogie” has posted upgraded firmware for the Humax Foxsat HDR. Since “mogie” is the familial name for “cat”, I was wondering whether these two people are really the same. I’ve been picking apart “mogie”’s update using the tools that “cat” mentioned. The only problem I found was that there are a lot of versions of unsquashfs, some of which work, and some which don’t. certainly the version that is available for Ubuntu gives problems. Where is the “official” version of unsquashfs? Posted on January 20, 2011 at 9:12 pm. To the question .. the latest unsquashfs version in Ubuntu is 1:4.0-8. I haven’t tested yet this version, the working one was the one mentioned in the other threads here. Posted on January 21, 2011 at 10:55 am. Many thanks for your inspiration. Posted on January 21, 2011 at 7:16 pm. can somebody help me and tell me if they recognize this problem? Posted on February 1, 2011 at 11:21 pm. Martin, we do provide a forum for all HUMAX iCord related issues. Please check http://www.icordforum.com. You need to register first to submit any posts. The forum does have also an English section under http://www.icordforum.com/index.php?page=Board&boardID=64. Posted on February 2, 2011 at 9:16 am. I feel silly, but cannot go thru a simple software update (I’m not a geek, that could be one reason).. I have iCord HD, the popup msg now on start up offers me to upgrade from 1.00.37 to 38. I tried installing OTA, it fails after 10-15 seconds bringing E-OS error on. I went on humax.com, couldn’t find anything there, found icordforum, got a copy of the upgrade file, put it on my USB stick, switched on the power on pvr with a Record button pressed, the machine reads COPY :000% and the screen shows ‘Downloading sw… 0%”, but nothing indeed happens. It stays like this for a good hour and no transfer happening (UBS stick is blinking at the same time). Posted on August 1, 2012 at 1:40 pm. Hi Aceq, I’m no longer dealing with iCord HD for a while now due to moving to my local cable provider. But I’ve something in mind that the USB stick MUST be FAT-32 formatted. Please give this a try; delete and format the USB stick properly with FAT-32 under Windows and retry. If this doesn’t help anymore there is an english section in iCord forum. The guys there are still really responsive. Posted on August 1, 2012 at 2:02 pm. did is sufort ccccam and shiring on recever humax icord hd plus ? Posted on November 28, 2012 at 9:23 pm. It’s neither supporting iCord HD+ nor CCcam. Posted on December 5, 2012 at 11:47 am. Thanks for a very interesting and informative blog. I have recently bought one of these boxes and I have been playing around with its various capabilities. I am interested in the various ports (populated and unpopulated) on the PCB. So far, I have got the EJTAG working and UARTC (the port by the card reader). However, I haven’t managed to find UARTB or UARTA. Does anyone have any info on these missing ports? There is a header in the centre of the board but this does not seem to be a UART. Does anyone know what this port is (possibly a BCM BBS (i2C) port)? Any info much appreciated. Posted on May 19, 2013 at 1:36 pm. Next: My 2nd hobby ..